The oceanfront condos at Kingston Plantation's Brighton Towers offer unique interiors with crown molding which add to the condos character. The kitchens are fully equipped with top of the line appliances. The kitchens are also complete with ceramic floors and granite counters. The master suites are large enough to accommodate closets for both him and her. The master bath features travertine marble floors, separate shower stall, and whirlpool tub along side the beautiful vanity counter tops. Aside from the striking features of the Brighton Towers building, the first floor meeting space spans around 20,000 sq. ft. The meeting space combined with the conference spaces of Kingston Shores and Kingston Plantation totals to over 100,000 square feet of space. This makes Kingston Plantation one of the best hotel conference destinations in the South East Region. It is also the largest convention destination along the entire Grand Stand. Further, guests are also treated to convenient attractions nearby such as the Splash Water Park located on the property. Owners at Brighton together with guests can also enjoy the large deck, hot tub and pool by the south end of the Brighton tower. 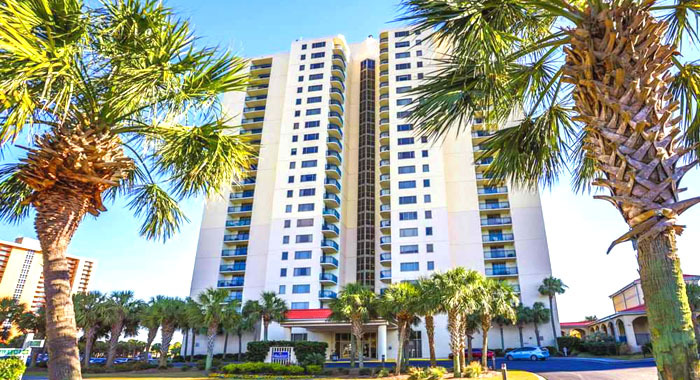 Parking is never a problem because Brighton Towers offers one of the largest parking garages in Myrtle Beach. There is also direct beach access which allows you to be on the white sand withing seconds of walking out your door. Residential units are available from 1,246 heated square feet to 2,116 heated square feet.